This is a list of sea captains. The list includes merchant ship's captains as well as naval ship's captains. It is limited to those notable in this role (those who already have Wikipedia articles). English navigator who went to Japan and is believed to be the first Briton ever to reach Japan. Danish-born navigator in the service of the Russian Navy, captain-komandor Витус Ионассен Беринг. The first European to discover Alaska and its Aleutian Islands. The Bering Strait, the Bering Sea, Bering Island, Bering Glacier and the Bering Land Bridge are named for the explorer. Last captain of SS United States, the biggest ocean liner ever built entirely in the United States and fastest passenger liner crossing the Atlantic Ocean in regular service. Japanese naval officer who participated in World War II. His most significant battles were the Battle of Leyte Gulf and at the East China Sea. Commodore in the United States Navy, notable for his victory over HMS Java during the War of 1812. Commodore in the United States Navy who served in the Revolutionary War and the War of 1812. Served in the Virginia Navy during the last years of the American Revolution and, nearly two decades later in 1798, received a commission as a lieutenant in the new U.S. Navy. Officer of the United States Navy and later Confederate Navy, acting as a representative in Europe for the Confederacy during the American Civil War. Officer in the Continental Navy and later in the United States Navy. Master mariner until he was found guilty of scuttling his ship and sentenced to twenty years transportation. At the time of his sentence he was married with seven children. He arrived in Western Australia on board Hougoumont in January 1868. Officer of the Royal Navy and a colonial administrator. The notorious mutiny occurred during his command of HMS Bounty in 1789; Bligh and his loyal men made a remarkable voyage to Timor, after being set adrift by the mutineers in Bounty's launch. Italian naval commander during Fascism and a hard-line fascist politician in post-war Italy. Officer in the United States Navy who became an admiral in the Confederate Navy during the American Civil War, and commanded the ironclad CSS Virginia. Portuguese navigator and explorer, generally regarded as the European discoverer of Brazil (April 22, 1500). Italian senior grade shipmaster, Master aboard SS Andrea Doria at time of fatal collision, on July 25, 1956, with Swedish MS Stockholm. Italian Line's Senior Captain. Irish-born founder of the Uruguayan Navy. Genoese navigator, colonizer and explorer whose voyages across the Atlantic Ocean, funded by Queen Isabella of Spain, led to general European awareness of the Americas in the Western Hemisphere. Sea captain who later operated a ship building business at Taunton, Massachusetts. He afterwards became a successful merchant in London and, in 1732, a trustee of James Oglethorpe's Georgia colony. Officer in the United States Navy, best known for sinking the Confederate ironclad CSS Albemarle during a daring nighttime raid on October 27, 1864, a feat for which he received the thanks of Congress. American naval officer notable for his heroism in the First Barbary War and the Second Barbary War and in the War of 1812. He was the youngest man to reach the rank of captain in the history of the U.S. Navy, and the first American celebrated as a national military hero who had not played a role in the American Revolution. English privateer, navigator, slaver, and politician of the Elizabethan era. He is known for circumnavigating the globe in command of Golden Hind between 1577 and 1580. British naval officer during the American War of Independence, the French Revolutionary Wars and the Napoleonic Wars, whose excellent career was cut short when he was killed by a cannonball at the Battle of Trafalgar. Vice-Admiral FitzRoy achieved lasting fame as the captain of HMS Beagle during Charles Darwin's famous voyage, and as a pioneering meteorologist who made accurate weather forecasting a reality. He was an able surveyor and hydrographer and served as Governor of New Zealand from 1843 to 1845. One of the first licensed marine pilots in the state of Oregon. Flavel would go on to amass a fortune with a business managing pilot boats on the Columbia River, making him one of the first millionaires in the state's history. Master of the Great Eastern Railway's steamship Brussels, and he was shot by the Germans in 1916 after he used his ship to try and ram U-33. Sometime after the attempt the Germans lay in wait for his ship and captured him. Second son of Vasco da Gama and brother of Cristóvão da Gama, and named after his paternal grandfather Estêvão da Gama. He commanded the fleet that entered the Red Sea, with the intent of attacking the Ottoman fleet in its harbor at Suez. Son of explorer Vasco da Gama, commanded a ship in the Red Sea against the Ottoman naval base at Suez. Portuguese explorer, son of Estêvão da Gama and the older brother of Vasco da Gama, he took part on the first sea trip from Europe to India, led by his brother, commanding the ship São Rafael, which would be later scuttled in the return trip. Paulo da Gama joined São Gabriel, but, already sick, died the day after his ship arrived at the Azores. Portuguese explorer, one of the most successful in the European Age of Discovery and the commander of the first ships to sail directly from Europe to India. Italian patriot, merchant marine captain, and soldier of the Risorgimento. Served in the Imperial Japanese Navy before and during World War II, and was the strategist behind the successful December 1941 attack on Pearl Harbor. Considered one of the most successful naval strategists and leaders in the history of the Imperial Japanese Navy. German-born, Australian-Canadian lawyer, author, academic, and Master Mariner. English mariner, empirical philosopher, nautical inventor, entrepreneur, and humanitarian. Captained the Brunel-designed leviathan SS Great Eastern which laid transoceanic telegraph cables in the late 19th century. Imperial Japanese naval commander during the Pacific War and the author of the IJN manual on torpedo attack techniques, famous for his high skill (particularly in torpedo warfare and night fighting). Commander of the Japanese submarine I-58 which sank USS Indianapolis on July 30, 1945, which was the single greatest disaster in US naval history. Captain of Exxon Valdez at the time of its 1989 oil spill. Officer in the Imperial Japanese Navy. His selfless sacrifice during the Russo-Japanese War elevated him to the status of a deified national hero. English sea explorer and navigator during the early 17th century, best known for his explorations of present-day Canada and parts of the northeastern United States. The Hudson River in the US, Hudson Bay in Canada, and numerous other geographical features are named after him. Officer in the Royal Netherlands Navy. A veteran submarine commander of World War II. De Jong graduated from the Royal Netherlands Naval College in 1934 and joined the Royal Netherlands Navy Submarine Service and served on HNLMS O 24 during World War II, he ended the war as the commanding officer of that vessel, HNLMS O 24 was one of the few Dutch submarines that survived the war. During his service in World War II he was awarded the Bronze Cross twice, the first time in 1934 and for the second time in 1940. He was also awarded the Distinguished Service Cross of the United Kingdom for his services during World War II. After World War II De Jong continued to serve in the Royal Netherlands Navy, commanding two frigates and serving as aide-de-camp to Queen Juliana. He eventually rose to the rank of captain but retired from active service in 1959. Later served as Prime Minister of the Netherlands from April 5, 1967 until July 6, 1971. Commodore, in the United States Navy. During the mid-1790s, the young Hull commanded several merchant vessels, losing some to French privateers. He was commissioned a lieutenant in the newly formed United States Navy in March 1798 and distinguished himself during the next two years while serving on board the frigate Constitution in the Quasi-War with France. Began his career at sea in the Merchant Navy, then entered the Royal Navy in 1746. Shortly after his promotion to lieutenant in 1755, Johnstone was court martialed for "insubordination and disobedience" however, his record of gallantry in combat taken into account, he was given a reprimand in 1757. He was promoted captain in 1762, and commodore in 1763. Later served as Member of Parliament. Officer in the U.S. Navy who became a commander in the Confederate Navy during the American Civil War. Scottish sailor and the United States' first well-known naval fighter in the American Revolution. U.S. Navy Commodore during the War of 1812 and the Mexican–American War. He began his naval career during the War of 1812, receiving honors for bravery at the Battle of Lake Borgne, Louisiana, delaying the British before the Battle of New Orleans. In 1826, he signed a treaty with King Kamehameha III of the Sandwich Islands. Japanese naval officer and statesman during the Late Tokugawa shogunate and the Meiji period. Kaishū was a nickname which he took from a piece of calligraphy (Kaishū Shooku 海舟書屋) by Sakuma Shōzan. His actual name was Rintarō. Greek naval admiral and statesman (first and third President of the Second Hellenic Republic). He was the head commander of the Hellenic Navy General Staff during the victorious Balkan Wars and World War I.
Guernsey Sea Captain widely credited in Costa Rica as having transformed the economy of this Central American country by establishing a direct regular trade route for Costa Rican coffee growers to the European market, thereby helping to establish the Costa Rican coffee trade. American anti-war activist. He was born in Exeter, New Hampshire. After graduating at Harvard in 1797 he took to the sea and came to be known as a capable New England captain. A disbeliever in war for any purpose, he turned landsman at the outbreak of the War of 1812 and devoted both his tongue and his pen to preaching non-resistance. American naval hero. During the War of 1812, he commanded USS Chesapeake in a single-ship action against HMS Shannon (commanded by Philip Broke). He is probably best known today for his dying command "Don't give up the ship! ", which is still a popular naval battle cry. American naval officer, most notably as commander of American naval forces in Lake Champlain during the War of 1812. One of the leading members of "Preble's Boys", a small group of naval officers who served during the First Barbary War, Macdonough's actions during the decisive Battle of Lake Champlain are often cited as a model of tactical preparation and execution. Portuguese maritime explorer who led the first circumnavigational expedition, and located the eponymous Strait of Magellan. He was also the first European to reach the Philippines. Lieutenant in the British Royal Navy aboard HMS Pearl, known for defeating the infamous pirate Blackbeard in battle. Captain in the United States Navy, notable for his command of Amphibious Squadron Five in the Gulf War. Late 19th century American naval officer later serving in Chinese service as a naval advisor during the First Sino-Japanese War. Although primarily skilled as an instructor and administrator, he proved a talented tactician during the Battle of the Yalu as well as the first American to command a modern battleship in wartime. First African American to command a vessel in the United States Merchant Marine. New England fishing schooner captain, noted for surviving a series of close calls at sea. British flag officer known for his participation in the Napoleonic Wars. He served in the Royal Navy for most of his life and won a number of significant victories, most notably at the Battle of Trafalgar in 1805, during which he lost his life. U.S. Navy officer and later a Union general in the American Civil War who commanded the Army of Kentucky. He holds the distinction of being the only naval officer to achieve the rank of major general on either side of the Civil War. He was shot and killed by a fellow Union general, Jefferson C. Davis, during an argument in 1862. Awarded a George Medal for his actions during an air attack by the Luftwaffe; Charged and convicted of piracy after being captured aboard the RN prize Criton by the Vichy French off Conakry; "The Man From Timbuctoo"; Instigator and overseer of the installation of the Thames Navigation Service. Born in Chicago, sailed in the Merchant Navy and Royal Navy, working his way up from ordinary seaman to quartermaster and bosun's mate, continuing on to merchant captain.a Later worked as a flight navigator, and was a pioneer of aviation. Was last seen in Lae, New Guinea on 2 July 1937 and disappeared with Amelia Earhart somewhere over the western Pacific during their World Flight. Captain of the Chilean steam tug Yelcho which rescued the 22 stranded crewmen of Sir Ernest Shackleton's ship Endurance from Elephant Island, Antarctica, in August 1916. One of the most successful arctic whalers to sail from Hull in the nineteenth century and for many years captain of the whale ship Truelove. Captain Parker was one of those who helped in the unsuccessful search for Sir John Franklin's missing 1845 expedition to find the North West Passage. In 1847, shocked by the impoverished condition of the Inuit inhabitants of Baffin Island he brought two of them, Memiadluck and Uckaluk, to England in order to publicise their plight, raise money, enlist government support for their relief and to persuade the Moravian Church to send a missionary to the region. British naval officer who was captain of the ship HMS Serapis during the American Revolution. He was defeated by John Paul Jones on September 23, 1779 in a pivotal battle. British naval officer. He fought during the American War of Independence, the French Revolutionary, and the Napoleonic Wars. Pellew is remembered as an officer and a gentleman of great courage and leadership, earning his land and titles through courage, leadership and skill – serving as a paradigm of the versatility and determination of Naval Officers during the Napoleonic Wars. Pellew makes fictional appearances in the Horatio Hornblower novels. Commodore of the U.S. Navy who compelled the opening of Japan to the West with the Convention of Kanagawa in 1854. Officer in the United States Navy. He served in the War of 1812 against Britain and earned the nickname "Hero of Lake Erie" for leading American forces in a decisive naval victory at the Battle of Lake Erie. U.S. merchant mariner, shipmaster and author, who served as captain aboard MV Maersk Alabama during its hijacking by Somali pirates in April 2009. Officer in the United States Navy and later the commander-in-chief of the Mexican Navy. Captain of Esmeralda, Prat was killed shortly after boarding the Peruvian armored monitor Huáscar at the Naval Battle of Iquique. Officer in the United States Navy and United States Merchant Marine, participated in the Revolutionary War, the Quasi-War with France, and the First Barbary War. Officer in the United States Navy during the War of 1812. He served in Constellation with Commodore Thomas Truxtun and in 1803 became master of the brig Merchant. During the War of 1812 he commanded the privateer General Armstrong and at Fayal, Azores, in 1814 engaged gunboats from British men-of-war en route to Jamaica and New Orleans, Louisiana. American naval officer who served in the United States Navy from its organization in the 1790s through the late 1830s. His service included the Quasi-War with France and the War of 1812. Son of Commodore John Rodgers, was born near Havre de Grace, Maryland. He was received his appointment as a midshipman in the Navy on 18 April 1828. Service in the Mediterranean on board Constellation and Concord opened his long career of distinguished service, and he commanded an expedition of Naval Infantry and Marines in Florida during the Seminole Wars. In the mid-1850s he succeeded Commander Ringgold in command of the North Pacific Exploring and Surveying Expedition, which added greatly to our knowledge of far eastern and northern waters. Following his promotion to commander in 1855, he married and settled to work in the Navy's Japan Office in Washington, D.C., where he was serving when the Civil War broke out. Within a fortnight after leaving the port of Brunswick Georgia enrout to Buenos Aires, Argintina, the steel four-masted barquentine, “Reform” ran into a violent winter storm sweeping her husband, Captain David Larkin Ross overboard "to a watery grave." For fifty days, Eliza Ann Ross took command of a crew that, except for the first mate, could not speak or understand english. For fear that they might mutiny, she had to make sure the crew were not aware that the captain was gone. Her brief command made her one of the world's first female Ship Captains. Captain for the Cunard Line and was the master of the ocean liner RMS Carpathia when it rescued the survivors of RMS Titanic which sank on April 15, 1912 after striking an iceberg. As the result of his efforts to reach Titanic before it sank, and his preparations for and conduct of the rescue of the survivors, Captain Rostron was lionized as a hero. He was awarded a Congressional Gold Medal by the U.S. Congress, and after World War I was appointed Knight Commander of the Order of the British Empire. He was made the Commodore of the Cunard fleet before retiring in 1931. Japanese naval officer who served during the Russo-Japanese War and one of the first submarine commanders of the Imperial Japanese Navy, known primarily as the commanding officer during the sinking of the submarine No. 6. Welsh-American merchant captain who served as an officer in the United States Navy during the Civil War, with the rank of Acting Master. He was wounded in action during the 1861 Battle of Port Royal. During 1863 he commanded the schooner USS Kittatinny as part of the West Gulf Blockading Squadron under Rear Admiral David Farragut. Seyburn resigned his commission in 1864 due to war injuries and initially settled in Maine. He later moved to Louisiana, where he operated a sugar plantation. British Admiral of the Fleet. Served in the Black Sea until the evacuation of Crimea in 1856. After the Crimean War, still a midshipman, he was appointed to HMS Calcutta, flagship of his uncle Sir Michael Seymour, on the China station. He took part in the capture of Canton (December 1857). In HMS Chesapeake Seymour took part in the attack on the Taku forts in September 1860. In December 1897, Seymour was appointed commander-in-chief on the China station. Service there was peaceful until the Boxer Rebellion. Seymour led the Naval Brigade in the relief of Peking. Captain of Campbell Macquarie and one of the earliest and best known merchant ship captains sailing out of Port Jackson. Captain of RMS Titanic when it sank in 1912. Joined the White Star Shipping Line in March 1880 as the Fourth Officer of Celtic. He served aboard the company's liners to Australia and to New York City, where he quickly rose in stature. In 1887, Smith received his first White Star command, SS Republic. In 1888, Smith earned his Extra Master's Certificate and joined the Royal Naval Reserve (thus enabling him to append his name with "RNR"), qualifying as a full lieutenant. This meant that in a time of war, Smith and his ship could be called upon to serve by the Royal Navy. Because of his position as a commander in the Royal Naval Reserve Smith had the distinction of being able to fly the Blue Duster of the RNR, most ships flew the Red Duster of the merchant marine. Captain of the A1 brig Williams, made and launched from Blyth; on a trip between the east and west coasts of South America, when passing around Cape Horn he circumnavigated strong headwinds and ventured south, discovering the South Shetland Islands in 1819, and later that year sighted the Antarctic Peninsula. United States naval officer, notable in the capture of California during the Mexican–American War. Stockton was from a notable political family and also served as a U.S. Senator from New Jersey. Captain, ship owner and corsair from St. Malo. Notable as French corsair during the Napoleonic Wars. Captain and Admiral of the Austrian and later Fleet Commander of the Austro-Hungarian Fleet. Considered one of the prominent naval commanders of the 19th century, Tegetthoff was known for his innovative tactics as well as his inspirational leadership. His most famous victory came against the much larger and more powerful Italian force sent to attack Lissa island which came about not only due to his aggressive tactics during the battle, but also due to his strategic insight in forcing the battle. In later years, his reforms completely changed the Austro-Hungarian Navy, and were in force up to the end of World War I.
British sea captain, merchant marine & American colonist born Henry Trew, the son of John Trew and Jane Garret, in Caister-On-Sea, Filby Parish, Norfolk, England in the year 1591. He was the master of a ketch, a small ship, named Returne, that hauled molasses and rum from the West Indies. He is believed to have emigrated to America in 1630 with the fleet of Sir Richard Saltonstall. There are numerous records of Henry True and of Returne sailing in and out of Virginia. Due to his early arrival in the Colonies, and the fact that few ships were built in America prior to 1641, Henry would have sailed to the New World on his own ship and then continued to make his livelihood carrying freight and/or passengers. Henry married in 1643 in Salem, Essex County, Massachusetts to Israel Pike, daughter of John Pike and Dorothy Day. Henry was a full member of Puritan Church (Congregational) while residing in Salem. He held waterfront land in Salem prior to moving to Salisbury—land which a vessel owner would find very convenient. Henry died sometime before 4 October 1659. There is no burial record for Henry. (He may have died at sea off the coast of Barbados.) His will indicated that he owed 9f (pounds) for a vessel. Israel and Henry had seven children born in Salem & Salisbury, Essex, Mass. (John, Henry B ., Mary, Lydia, Joseph, Benjamin, and Jemima). Henry True Descendants on the Frontier: Genealogy of the Family of True by Elinor O. Merrill True, Kingston, NH, p. 377. Henry is first recorded in America in Salem, Massachusetts, by the purchase of a house according to a deed dated 16 August 1644: "I, Edward Gibens, doe acknowleg Deed or Bill of Sale to have Received of Henry Trew of Salem fower pound for the house in Salem, which was Mr. Strattons; and by this payment doe give him fulle perseion of the said house; to him and his forever." This deed is recorded in the first volume of Records at Salem, MA. Henry was granted forty acres of land in 1649. He had a lot in "Southfield" in 1653 and a lot on South River in 1658. Several accounts have Henry True and his family moving to Salisbury, Massachusetts, ca. 1657. He bought a house and land in Salisbury from a Richard North in 1657. His widow refers to herself as "of Salsibury" in 1659 which might indicate that the family had moved there before that time. Henry True was a mariner and continued sailing for his living after emigrating to America. This is supported by the fact that it is recorded on 18 September 1656, that the ketch Returne, Henry Trew, Master, is "sailing from Barbados, being then on Carlisle Bay, bound for Boston with Molasses." American naval officer who rose to the rank of commodore. Truxtun had little formal education before joining the crew of the British merchant ship Pitt at the age of twelve. However, by the time he was twenty his talents had garnered him the command of his own vessel, Andrew Caldwell. He operated as a privateer during the American Revolution, commanding several ships: Congress, Independence, Mars and St. James. Truxtun was highly successful in capturing enemy ships during this period, not once suffering a defeat. After the war, he returned to the merchant marine, where he remained for twelve years, and in 1786 commanded one of the first American ships to engage in trade with China, Canton operating from Philadelphia. Irish captain of the schooner Denbighshire Lass. After inheriting her father's shipping company in the 1880s, Tyrrell fought to have her name on the documents of ownership for the schooner (women were not permitted to do this at the time). She won her legal battle for recognition in 1899. Her career as sea captain spanned over twenty years, and Denbighshire Lass was the first ship to fly the Irish tricolour flag at a foreign port. Fishing schooner captain out of Lunenburg, Nova Scotia. He was a highliner fishing captain and captain of the schooner Bluenose, winning multiple races for the International Fisherman's Trophy. Fishing schooner captain from Gloucester, Massachusetts. He was captain of the schooner Esperanto in 1920 when it defeated the Canadian schooner Delawana in the first International Fishing Schooner Championship Races in Halifax, Nova Scotia. American naval officer and explorer. He is particularly noted for his 1838–1842 Pacific expedition as well as for his role in the Trent Affair during the Civil War. Captain of the whaling vessels Phoenix and Edward Cary. English sea captain, known as the master of the sailing clipper Cutty Sark during her most successful period of service in the wool trade between Australia and the United Kingdom. Prominent sea captain, businessman and philanthropist in New Jersey and Pennsylvania involved in the spice and silk trade, glass-making, and missionary work. Spanish captain, who completed the first circumnavigation of the Earth (1519–1522). Chinese mariner, explorer, diplomat and fleet admiral, who commanded Ming China's treasure voyages from 1405 to 1433. Captain Jakob Störr in 'The Story of My Wife', written by Milán Füst. Gilbert and Sullivan refers to the Victorian-era theatrical partnership of the dramatist W. S. Gilbert (1836–1911) and the composer Arthur Sullivan (1842–1900) and to the works they jointly created. The two men collaborated on fourteen comic operas between 1871 and 1896, of which H.M.S. Pinafore, The Pirates of Penzance and The Mikado are among the best known. The Pirates of Penzance; or, The Slave of Duty is a comic opera in two acts, with music by Arthur Sullivan and libretto by W. S. Gilbert. The opera's official premiere was at the Fifth Avenue Theatre in New York City on 31 December 1879, where the show was well received by both audiences and critics. Its London debut was on 3 April 1880, at the Opera Comique, where it ran for 363 performances, having already been playing successfully for more than three months in New York. H.M.S. Pinafore; or, The Lass That Loved a Sailor is a comic opera in two acts, with music by Arthur Sullivan and a libretto by W. S. Gilbert. It opened at the Opera Comique in London, on 25 May 1878 and ran for 571 performances, which was the second-longest run of any musical theatre piece up to that time. H.M.S. Pinafore was Gilbert and Sullivan's fourth operatic collaboration and their first international sensation. Master and Commander is a nautical historical novel by the English author Patrick O'Brian, first published in 1969 in the US and 1970 in UK. The book proved to be the start of the 20-novel Aubrey-Maturin series, set largely in the era of the Napoleonic Wars, that O'Brian continued working on up until his death in 2000. 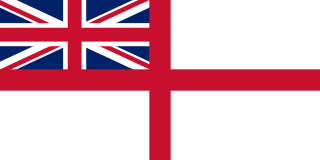 This is an alphabetical list of the names of all ships that have been in service with the Royal Navy, or with predecessor fleets formally in the service of the Kingdom of England or the Commonwealth of England. The list also includes fictional vessels which have prominently featured in literature about the Royal Navy. Many of the names have been re-used over the years and thus represent more than one ship. Captain Pugwash is a fictional pirate in a series of British children's comic strips and books created by John Ryan. The character's adventures were adapted into a TV series, using cardboard cut-outs filmed in live-action, also called Captain Pugwash, first shown on the BBC in 1957, a later colour series, first shown in 1974–75, and a traditional animation series, The Adventures of Captain Pugwash, first aired in 1998. The Mauritius Command is the fourth naval historical novel in the Aubrey-Maturin series by Patrick O'Brian, first published in 1977. In English-speaking popular culture, the modern pirate stereotype owes its attributes mostly to the imagined tradition of the 18th century Caribbean pirate sailing off the Spanish Main and to such celebrated 20th century depictions as Captain Hook and his crew in the theatrical and film versions of Peter Pan, Robert Newton's portrayal of Long John Silver in the 1950 film of Treasure Island, and various adaptations of the Eastern pirate, Sinbad the Sailor. In these and countless other books, movies, and legends, pirates are portrayed as "swashbucklers" and "plunderers." They are shown on ships, often wearing eyepatches or peg legs, having a parrot perched on their shoulder, and saying phrases like "Arr, matey" and "Avast, me hearty." Pirates have retained their image through pirate-themed tourist attractions, traditional film and toy portrayals of pirates, and the continued performance and reading of books and plays featuring pirates. Our Island Home is a one-act musical entertainment with a libretto by W. S. Gilbert and music by Thomas German Reed that premiered on 20 June 1870 at the Royal Gallery of Illustration. The piece has five characters and is "biographical", in that the characters in the original production played themselves, except that they were given personalities opposite to their actual personalities. The Road to Samarcand is a novel by English author Patrick O'Brian, published in 1954 and set in Asia during the 1930s. Derrick, an American teen, is brought to China with his missionary parents, then orphaned. He goes to sea with his uncle Captain Sullivan and Ross, the Captain's friend, starting out on the South China Sea. They are the core of a group who has adventures on the road to Samarcand, using skills as required by the challenges of the journey, often for the first time in their lives. They begin on the oldest ways of transportation and end on the newest. Sir George Power, 7th Baronet was an operatic tenor known for his performances in early Gilbert and Sullivan operas with the D'Oyly Carte Opera Company, most famously creating the roles in London of Ralph Rackstraw in H.M.S. Pinafore (1878) and Frederic in The Pirates of Penzance (1880). Nautical fiction, frequently also naval fiction, sea fiction, naval adventure fiction or maritime fiction, is a genre of literature with a setting on or near the sea, that focuses on the human relationship to the sea and sea voyages and highlights nautical culture in these environments. The settings of nautical fiction vary greatly, including merchant ships, liners, naval ships, fishing vessels, life boats, etc., along with sea ports and fishing villages. 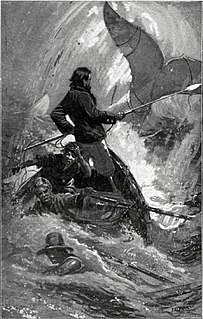 When describing nautical fiction, scholars most frequently refer to novels, novellas, and short stories, sometimes under the name of sea novels or sea stories. These works are sometimes adapted for the theatre, film and television.